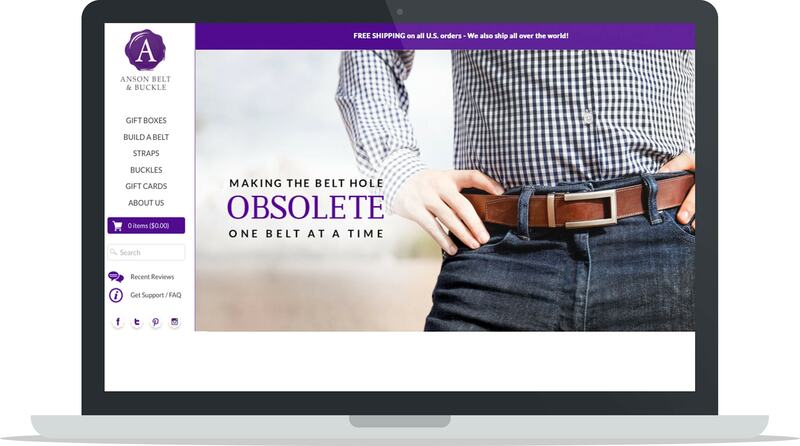 In this case study learn about Anson Belt & Buckle, an ecommerce business that specializes in selling micro-adjustable, holeless belts. Ever since the founder, Frank Ferree, purchased this unique type of belt from a vendor in Asia whilst he was travelling there, it changed his life and he knew it could do the same for others. Since he was unable to find the same kind of belt from any retailers in the United States, he channeled his passion for holeless belts into a business, bringing on his son David full-time in 2013. To learn more about how they refined the look of the belt while maintaining the micro-adjustable mechanism, the strategies and tools they use to build and grow their business and their future plans, read on. What is Anson Belt & Buckle? 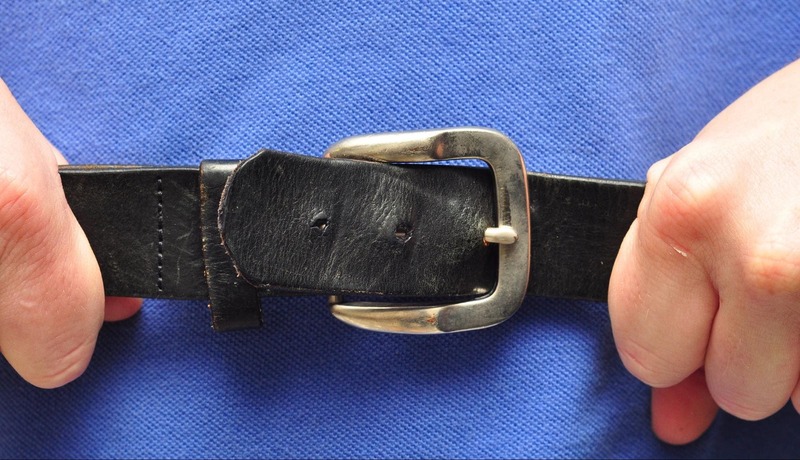 Anson Belt & Buckle is a micro-adjustable, holeless belt. Instead of 5 holes, 1 inch apart like most traditional belts, Anson Belt has 30+ options ¼” apart. This is thanks to a special buckle that interacts with a track system intricately sewn into the back of the strap. It essentially acts like a ratcheting system. The concept of ratchet belts is nothing new and has been around in Asia and Eastern Europe for 50+ years. It wasn’t until 2009 when we came on the scene that more competitors started popping up stateside. We were one of the first to introduce it to American consumers and continue to be a leader in our market. We don’t have a patent on our design as it is considered public domain being that it was sold on the open market place for more than a year without a patent. This is the same design (magnetic) that you’ll find with most ratchet belts on the market. What is your background? 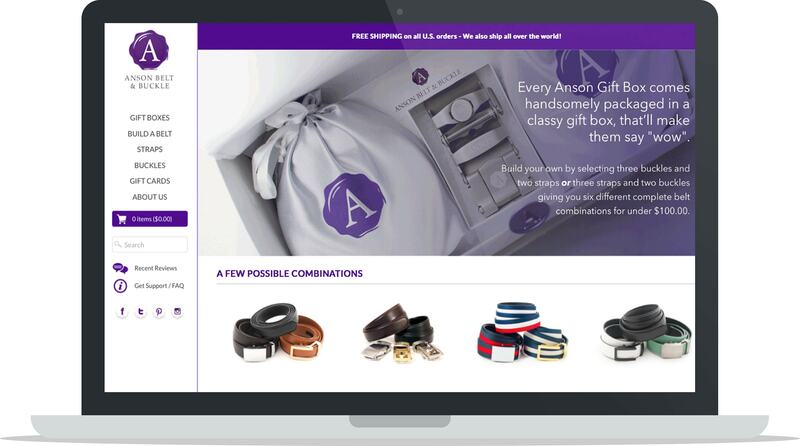 What were you [David Ferree] doing before you co-founded Anson Belt? I have a Bachelor of Science in Communications from East Carolina and have worked in a variety of marketing and customer service positions prior to creating Anson Belt & Buckle with my father in 2009. It wasn’t until 2013 that I was laid off from my job and finally was able to dive headfirst into Anson Belt & Buckle. I had been wanting to quit for months to focus on Anson but my wife was adamant that I didn’t “quit or get fired”. It was the perfect case scenario and couldn’t have turned out better. From that day on I have been 100% focused on Anson Belt & Buckle and our growth has been exponential. When did you realise there was the potential for a business around this product? The original holeless belt that my father purchased in China aesthetically wasn’t that pleasing to me. We linked up with an industrial engineer to redesign the cosmetics of the buckle. We tweaked a few things that we didn’t like and kept what we did. We started with 3 buckles and 2 straps and now have over 1,300+ possible complete belt combinations. Like most start ups our first sales came from friends and family. However, our first big break came when I was able to get onto a local radio show. Thanks to the help of my old boss that was doing some marketing for us she was able to land me a spot as a live audience member on one of the most popular morning drive shows in the Triangle area (Raleigh, Durham, Chapel Hill North Carolina). We knew that would be a great opportunity to reach a large audience if I could just get behind the mic. When the hosts asked if any audience members would like to participate in a game I immediately raised my hand. I was able to go up there and sit behind the microphone. During a commercial break I presented all three of the hosts with belts. They were absolutely blown away with them and we’re still talking about them when they came back from the commercial. It was absolutely perfect. They went on for another 45 seconds to a minute about the belt, asking me to talk more about them. I took the opportunity to introduce their listeners to hole-less belts, and to shout out AnsonBelt.com of course. The orders started flooding in. It was nothing crazy, but having just started out, a boost like that in sales was just what we needed. What strategies helped you grow to where you are now? The first few years of sales were dreadfully slow. We were essentially just doing word-of-mouth advertising and getting picked up locally in newspaper or magazine articles when given the opportunity. In 2013 (right after I was laid off) we launched a radio endorsement campaign on a morning drive show in Northern California. It sounds completely random, I know. It turns out my brother-in-law is a adamant listener and he kept hearing them talk about how their belts just didn’t fit. We ended up reaching out and eventually ran an endorsement campaign with them promoting our belts. We went from spending zero dollars on marketing too close to 10k a month. It was a huge risk but ended up bringing in sales like we had never seen before. It allowed us to build a strong foundation and customer base that would prepare us for the success we began to have in 2016. From about 2016 on we have truly began to grow exponentially. We aren’t currently running radio campaigns but are working with many influencers on a variety of platforms to spread the word about our belts. As an online business you have to continue to adapt to the strategies and tactics that work to generate traffic and sales. It is ever evolving and if you don’t stay ahead you will fall behind. We are always looking for the next best way to introduce our belt to consumers. What’s your strategy for growing Instagram? Why do you think it’s important? Our strategy for growing our Instagram is top secret so I can’t divulge that. Haha I’m only kidding, it’s not rocket science but there is a little strategy behind it. We have been fortunate enough to have been embraced by many influencers on Instagram. The great thing about a belt is that it is necessary in almost every outfit. You can’t wear the same shirt every day, but you can often wear the same belt. Influencers also love to use their belt to tie together an outfit and with our many styles and materials, there is something for every occasion. 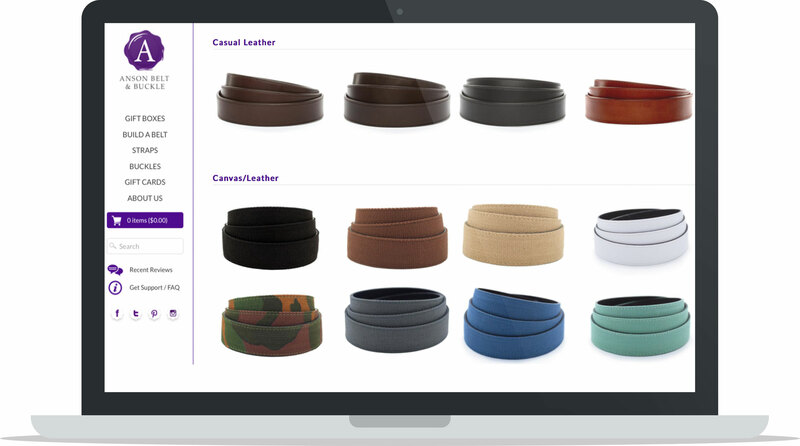 Some may think it would be difficult to keep it fresh only offering a single product, however, being that our product is a belt it can continuously be featured in images. If you check out our Instagram you’ll see that our belts are used with casual and formal wear, making the possibilities endless. A lot of our followers follow us not only to check out new belt styles but also to get inspiration from our many influencers around IG using our belts. What are some of the tools that help you manage your business? Shopify is definitely the cornerstone of our business. It is our ecommerce platform and our home base for just about all that we do. We take advantage of the many plug-ins that Shopify offers such as Klaviyo, YOTPO, and the Shopify specific app for our web developer that makes it easy to submit tickets. What are you working towards now/excited for? We are actually working on a complete re-branding. This is the first that I have mentioned that publicly but we could not be more excited. When we first began we really just offered a dress belt. The brand felt classy and elegant, which is one reason we used a wax stamp. As our offering has grown we have developed as a brand. We offer a huge variety of straps now from formal to casual leather, cloth, canvas, soon to be suede and even a tactical nylon. We are much more than we were when we began. I feel like the new logo is more representative of the brand today and has the potential to be more iconic. We have completely redesigned the packaging and website will follow suit. I couldn’t be more excited, or scared as hell haha. It’s a big move but necessary for our future growth in my opinion. So stay tuned!